As data discovery is becoming increasingly relevant for a variety of businesses and departments, tools must support an extensive range of use cases. To enable business users to deliver trusted and high-quality results in challenging use cases and in an efficient manner, data discovery tools must provide more than just excellent usability. 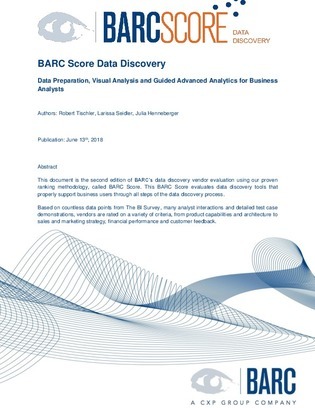 In this report, BARC evaluated vendors across specific capabilities and identified the market leaders in the data preparation, visual analysis, and guided advanced analytics for business analysts categories. Download the report for an in-depth breakdown of who the market leaders are.